For my final card of this release, I've inked up the Tickle My Fancy stamp set. 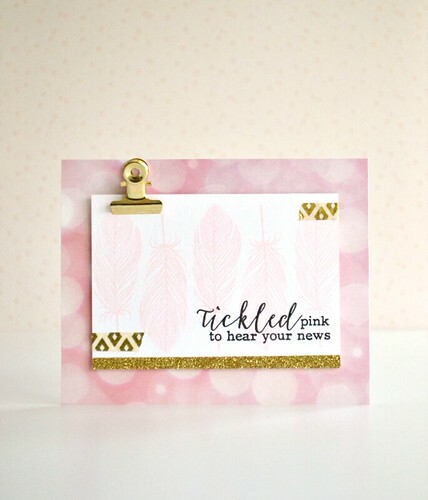 This fabulous set features both solid and linear feather designs with a variety of sentiments. It's ideal for both focal points and background stamping! I decided to put a bit of a literal spin on the tickled pink sentiment by playing with some pink ink and a sheet of pink bokeh BoBunny paper from the You're Invited collection. Thanks so much popping by here today, your visits are always appreciated! Lovely card! Love the golden details! Pink & gold is such an elegant colour combination. Love your card design. Oh my, how amazing! Look at the pastels - completely gorgeous! Paperbabe Stamps 3rd Anniversary Blog Hop!